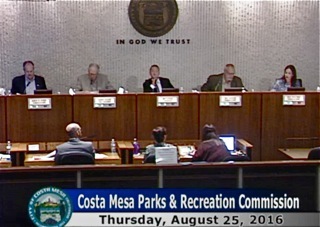 The Costa Mesa Parks and Recreation Commission met last night and had a light agenda, HERE. However, it still took more than two hours for them to work their way through it. Beth Refakes reminded us of the current gown drive for the Marines at Camp Pendleton that continues through September 15th. Donations may be dropped off at City Hall. 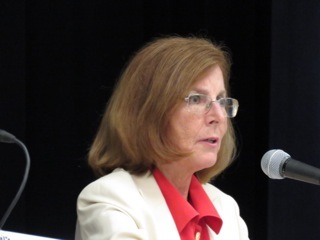 An unidentified speaker reminded us of the Banning Ranch hearing at the Newport Beach City Hall on September 7th beginning at 9:00 a.m. She also encouraged us all to vote. Commissioner Julie Mercurio had nothing to say. (I feared she had permanently lost her voice, since she's had nothing to say for the past several meetings on any subject). Byron de Arakal told the commission that AB 385, the bill to do away with Daylight Saving Time, died on the Senate floor. He also mentioned AJR28, which apparently is designed to make Daylight Savings Time permanent year around. He spoke about the negative impact of AB 109 and Prop 47 on our communities and spoke of Prop 57, which is on the November ballot, which will only exacerbate the negative impacts of the other two. He spoke of the sucess of the OC Fair and the Olympics and local Olympic stars. Kim Pederson spoke about the Master Plan Outreach meetings, citing a good turnout of passionate people. He also spoke of the need to move forward with lighting fields, and that the Newport Mesa School District Board just approved a contract with a consultant to study which of their fields might receive permanent lighting. He said, flat out, that we have plenty of fields, just not enough of them lighted. Bob Graham showed images of Vista Park, along Victoria Street, to demonstrate the danger that exists due to a lack of fencing and asked Bruce Hartley if it was possible to install a fence. He told Graham that it didn't make the cut in the last few budgets. 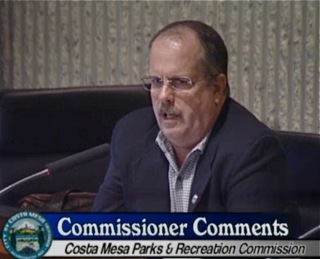 Graham also asked that somebody consider acquiring naming rights to Huntington Beach State Park and call it Costa Mesa State Park. 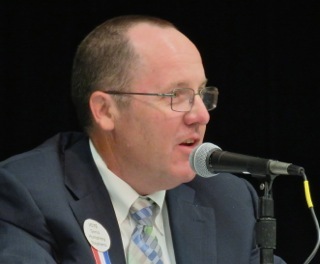 Chairman Brett Eckles commented on the Olympics, then told us the past 3, 4 and 5 years he has never seen so much support for sports in the city and gave credit to Steve Mensinger for this "achievment" - as blatant a campaign plug as I've seen lately. He also spoke of the need for lighted fields, citing the fact that 89% of the fields in our city are school district fields. Most of the time was spent dealing with yet another tree removal request at 3081 Klondike Avenue, in the neighborhood entered from Bear Street via Yukon, HERE. That neighborhood entry has been the subject of controversy - and numerous tree removal requests - for several years. The predominant tree, the Canary Island Pine, is a beautiful tree but it turns out to have been a problematic choice when this development was created. The applicant, Gabriella Oseguera, was joined by more than a half-dozen of her neighbors requesting trees in the parkway and adjacent to her property on the slope landscaped area be removed. The result, after much discussion, was to have one tree that apparently is damaging a wall removed at the City's expense and the remaining two - those in the parkway - removed at the applicants cost, which includes a 3-for-one replacement. It was decided to NOT replace those specific trees, but the replacement of trees would occur elsewhere in the city. 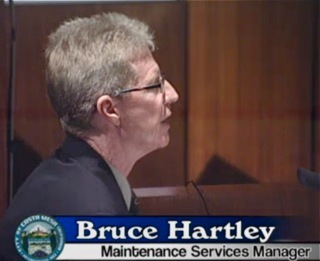 During his Maintenance Services Managers report Bruce Hartley provides some grim information to the commission. Due to the ongoing drought conditions our urban forest is in bad shape. He ticked off many statistics - none of which were available as a staff report online. He spoke of the diseases that are affecting our forest, including the shot hole borer that afflicts Sycamore trees in town. He told the commission that more frequent watering will begin the solution, but it won't happen overnight. It will take years of "normal" rainfall for the forest to regain a healthy condition. WHAT ABOUT HOMELESS IMPACT ON PARKS? 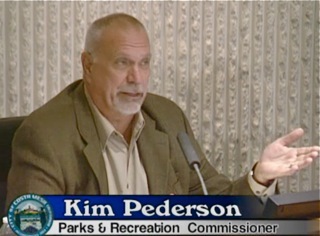 Commissioner Kim Pederson asked Hartley about the impact of the homeless on our parks. 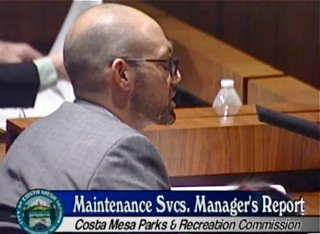 Hartley told him it was a HUGE impact, and that the maintenance of our parks is much more complicated due to the encampments in them. He cited the need to pick up drug paraphernalia and the need to frequently powerwash places like the Senior Center due to the infestation of homeless folks. He told us he's heard from mothers who are afraid to visit the parks because of the homeless/rehab folks who infest them. Justin Martin's Recreation Manager's Report was more positive. The summer programs are winding down and enrollment was good. The City will offer 199 classes during the upcoming fall session. 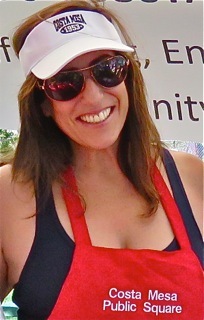 Oh, yes.. new commissioner Julie Mercurio apparently has found her voice again. She actually spoke a few times during the meeting, although her inexperience and apparent lack of doing her homework showed through. We expect more from her. 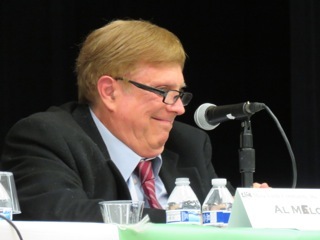 The City Council Candidate Forum hosted by Mesa Verde Community, Inc., last night ran as smooth as silk - perhaps, in part, because three of the seven candidates failed to show up. Council candidates Steve Mensinger, Allan Mansoor and Lee Ramos failed to appear even though the hosts prepared a seat at the table for each of them. We won't talk too much about their absence except to observe that more than 150 residents missed a chance to hear their answers to some pretty darn good questions. We're told that a couple had schedule conflicts. I don't believe that for one second. I think they just have a hard place in their hearts for the hosts, so they decided to sit this one out. However, the meeting was a great success. 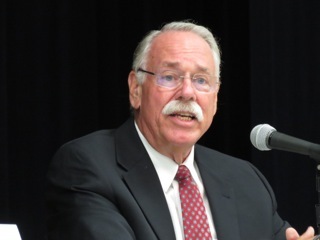 John Leffler, representing the Mesa Verde Community, Inc. Board, welcomed the crowd promptly at 7:00 and introduced the moderator - former mayor Mary Hornbuckle - who took the baton and held it firmly all evening. She did a wonderful job of keeping the candidates in line and moved the process through briskly. She mixed just the right amount of humor with her assignment. 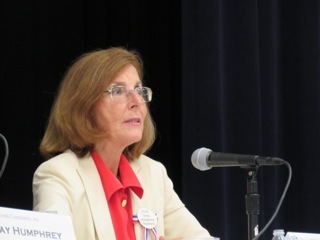 After each of the four candidates present - Lawyer John Stephens, Retired CPA Al Melone, former councilman Jay Humphrey and councilwoman Sandy Genis - took two minutes to introduce themselves and explain why they were running, Hornbuckle proceeded with a series of questions, each of which were asked of each candidate in order. She rotated the order for the sake of fairness. The first set of questions allowed up to two minutes to answer, after which the dreaded red card would be flashed and their speaking door would be slammed. Subsequent questions allowed one minute for a response and, later, only 30 seconds. I'm going to give you a summary of the responses - not replay every single word. This event was taped for replay later by First Impressions Video so you can see the whole thing if you wish. RIGHT TYPE OF GROWTH FOR COSTA MESA? First up was a question about "the right type of growth for Costa Mesa". Humphrey mentioned controlled development, and spoke about the current plans for more high density housing. He also mentioned the Smart Growth Initiative. He indicated the council should hear from the public. Genis emphasized that the "right type of growth" should take into consideration the needs of the current residents - services, work opportunities and should have a balance of residential, commercial and industrial. Citing the many developments around town, she described them as "a hodge podge of stuff going up." She was concerned that we are replacing jobs with ticky-tacky housing that will be bad for the environment and for living. Stephens agreed with them and observed that we have a Planning Commission and asked "Shouldn't they be doing some planning?" instead of just approving. He cited enormous developments, like 125 Baker Street and the four story with roof garden developments popping up. He specifically mentioned the radius around 17th Street and Pomona, where developments are sprouting up all around that area. 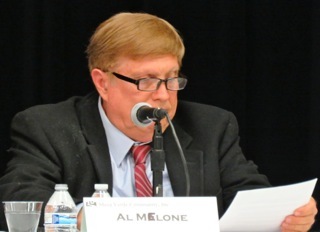 Melone observed that we are not like Irvine - we are a built-out city and our population is staying fairly level. He agreed with the other candidates. HOW TO LOWER CRIME RATE? Melone said better allocation of resources. He said Quality of life = safety, which means more police and fire personnel. Stephens agreed with Melone and said we need more police officers, indicating that "perception becomes reality" when it is known we have too few cops criminals take advantage of it. He cited the reasons for fewer cops and said we need to elect different councl members to help solve the problem. Genis also said we need to get the number of cops up because our current staffing levels makes us a sitting duck. She disagreed with those (Righeimer) who said more cops doesn't mean less crime. She criticized the current council majority because they continue to blow off studies by expensive consultants that tell them we need more police. She mentioned the lawsuit between Mensinger and Mayor Pro Tem Jim Righeimer and the police association as problematic. Humphrey agreed and said currently the Fire Rescue Service and the Police Staff are working too much overtime, which puts strain on their health and performance. STRATEGY FOR REDUCING UNFUNDED PENSION LIABILITY? Stephens mentioned he had been on the Pension Oversight Committee for a couple years. He suggested pre-paying the pension and paying down the Fire Side Fund, which is currently costing us 7.5% interest. Genis agreed with him, and recalled several expensive consultants that had been hired to advise on this issue. They all recommended paying ahead on the Fire Side Fund. Humphrey said we need to prioritize and pay down the debt. Melone observed that the economy may go south again so we shouldn't pay ahead when it would go away anyhow. DEALING WITH SOBER LIVING HOMES? Genis said we have new ordinances but are not enforcing them. She also expressed disappointment that we didn't look at what other cities had done - Orange, specifically. Stephens said we should be going after the bad operators and put more resources behind enforcement of our laws. Melone suggested that we do what Newport Beach did - spend millions in legal fees to make sober living operators aware they are not welcome in that city. (He didn't include in his response that those Newport Beach operators just came across the border to Newport Beach). Humhprey also stressed enforcement and cited group homes on Royal Palm that were problematic. MENTIONING SOUTH COAST PLAZA, WHAT ABOUT DIVERSIFYING THE TAX BASE? Melone said we should be extremely grateful for South Coast Plaza, but that the current council doesn't know how to spend our money. Stephens said the key is tourism. We should do as councilwoman Katrina Foley has been trying to do for a couple years and ramp-up our emphasis on tourism, generating more Transient Occupancy Tax (TOT). Genis mentioned the Sales Tax generated by South Coast Plaza and the car dealerships, but emphasized the need to do a better job of strengthening our reserves - save, don't spend. Humphrey said he thinks we have a balanced economy, but we've not done a good job of building back our reserves in the event of another economic downturn. Put more money away for a rainy day. WHAT ABOUT THE BALLOT MEASURE FOR VOTER CONTROL OF GROWTH? 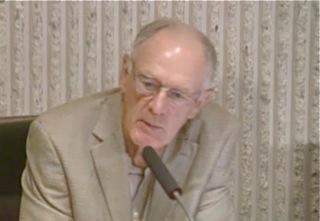 Humphrey said the people need to be able to say "enough is enough". He was concerned about the traffic impacts of the high density housing being built/proposed. He said we need good planned development. Genis said the people who live her should have a voice. She emphasized that those with a vested interest should be heard. Stephens, who apparently is not 100% sold on the Smart Growth Initiative, said the solution is to elect people in November that will listen to the residents. He said the initiative wouldn't exist if he and Humphrey had been elected in the past two elections. He said that, while he understands why the initiative was launched, it's not the best solution. That solution is to elect a different council majority. Melone muttered something about there never being enough money to pay for projects. Geez! THE FIRST 30 SECOND QUESTION - YOUR MOST NECESSARY CHANGE IN COSTA MESA? Stephens said make it safer and immediately begin ambulance transport. Genis said restore respect for residents, employees and tell the truth. She said the current council majority doesn't respect you enough to tell you the truth. Humphrey said safety. Get the Police and Fire Departments back to proper staffing. Melone said Group Homes, describing them as a plague. Melone said he didn't have enough information, so he passed on the question. This is a perfect reason that he should not have been on the ballot. Humphrey said we spent $1.5 million on the units which should be deployed. He cited the millions in income the city would receive if we did so. Genis said we should immediately go to medical transport and get the Fire Department up to staff. Stephens said it was a no-brainer - we should immediately begin medical transport. Genis said a "carrot and stick" approach should be used - enforcement and supportive housing. She said some of the homeless just need a little help. 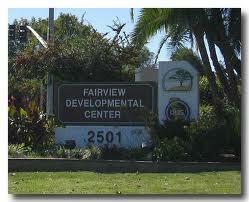 She refered to the Fairview Developmental Center as a place for transitional housing. Humphrey agreed with Genis and said there is a City fund to help with transitional housing. Melone said Genis hit the nail on the head. We need supportive housing. Stephens agreed with the others and spoke about the broad spectrum of homeless folks that need help. Humphrey said Medical Marijuana is important for folks that actually need it. He said we need to control the process. Genis agreed that the people who have a valid medical need should have access to it, with proper controls. Stephens said this is not the right time for Costa Mesa to have dispensaries - that we should wait for the State to get their rules sorted out first. He cited our current public safety challenges. Melone agreed with Stephens and said the "medicine" should be dispensed by pharmacies, and with no sales tax. Genis said healthy reserves; pay down the pension liability; retain Fairview Park as a natural park forever; Expand the SMART program for the youth; balanced growth; development that will actually pay its way and a new animal shelter. Humphrey said a vibrant, healthy city that knows where it's going. He wants balanced development, a return of the City of the Arts and protection for all our parks, including Fairview Park. Melone cited quality of life and an animal shelter. Stephens said he wanted to leave behind a different attitude about governance, where people actually listened. He wants to leave behind after his eight years on the council a atmosphere where people receive thoughtful consideration of their opinions - a place where we are nice to each other and we can build consensus. Then they began questions from the audience, with a 1 minute time limit on responses. MERGER OF MESA WATER AND COSTA MESA SANITARY DISTRICT? Humphrey is against it. It looks like a power grab. Melone agreed. He said he didn't know why they wanted it. It looks like a power grab. Stephens said he really didn't know enough about it, but is a very satisfied customer of both entities. He said, "If it's not broke, don't fix it". He said it appeared that Mesa Water is trying to jam this through, and that there should be more meetings. He said it should not be on the ballot. Genis recalled that 30 or so years ago both entities had offices at City Hall and there was talk of the City taking both over, but it was rejected. She said each has different missions. She said it looks like one agency trying to glom onto another agency's revenue. BEST PART OF COSTA MESA - YOUR SKILLS TO MAKE IT EVEN BETTER? Melone said bring more fairness and participation by residents. Stephens said, with a smile, "Costa Mesans and Mexican Food". He looked at the audience and said "YOU are the best part of Costa Mesa!" 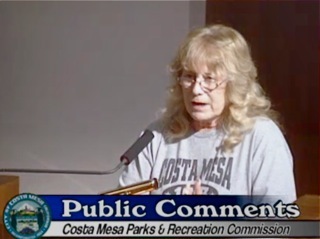 Genis said "The people of Costa Mesa", citing ethnic diversity. She said our differences make life interesting and that we're in this together for the long haul. Humphrey said the city's diversity - that we learn from each other. He said Fairview Park, a jewel that should be protected. He also mentioned Talbert Park, which may someday become part of Fairview Park. YOUR STAND ON FAIRVIEW PARK AND BANNING RANCH? Stephens said keep Fairview Park natural forever and save Banning Ranch. Genis acknowledged Dr. Richard Mehren - the father of Fairview Park - in the audience and said she was the only elected official to speak in Long Beach against the development of Banning Ranch. 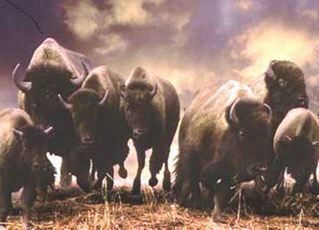 Humphrey said keep Fairview Park natural. He said Banning Ranch should not be developed, but should be cleaned up by the owners. Melone said "Once again they stole my thunder." WHAT ABOUT OUR NEGATIVE NEIGHBORS, THE VAGABOND INN AND MOTEL 6? Genis said we do have some motels that cause problems. She spoke about one that became a Single Room Occupancy facility to meet affordable housing demands. Humphrey said we should enforce our codes against the bad actors. He referred to the recent conversion of a problem motel into the BLVD Hotel on Newport Boulevard. 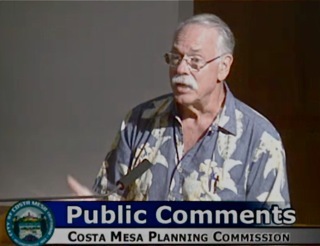 He said the solution should be what is best for Costa Mesa, not developers. 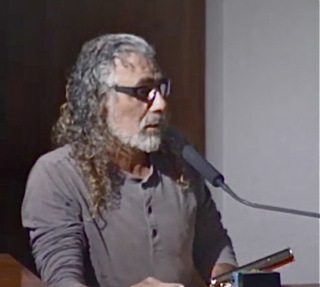 Melone said he didn't think his Mesa Verde neighbors think there is a problem with those two motels. He said we need a Vice Squad, trained to control prostitution. He said the "motel thing" is a "diversion" from other issues. Stephens said flat out that the motel issue is more of a land grab, to facilitate more High Density housing. He agreed that we need more police and a Vice Squad, but we also need some of the motels that serve as last resort housing for folks who would otherwise be homeless. REDISTRICTING OF CITY AS DEFINED ON THE BALLOT? Humphrey said NO! It would dilute the Latino vote. Melone said NO! He's against the whole idea of it, but if forced, we should use one of the 5 district choices. Stephens said district voting IS going to happen and said 5 districts may be the way to go. Districting is not the best way to place Latinos on the council, but that they do deserve a voice. He's against the 6 district and directly elected mayor choice that's on the ballot. Genis said NO! She prefers a 5 district choice. She said the current item on the ballot will only exacerbate the current abuse of power we see in the city. WHAT ABOUT FIXING STREETS AND POTHOLES? Melone asked "what potholes?". He said our streets are nice, and reminded us we have no snow, ice or sleet. Stephens said our streets are much better than where he grew up in San Gabriel. He said he can live forever without the medians in Mesa Verde and elsewhere. Genis cited a couple problem areas that need targeted repairs. Humphrey said we need to prioritize our street repairs and that we're spending too much on medians that are not needed or wanted. NEIGHBORHOOD STREETS FILLED WITH CARS - PERMIT PARKING? Stephens said perhaps we should lower the threshhold for permit parking in residential neighborhoods. Much of this problem is due to high density housing nearby. Genis blamed it on high density housing and Small Lot Developments that replace one home with six or more and provide inadequate guest parking. She said we need more enforcement. Humphrey cited apartment complexes that lease out garage space as a problem. Melone said permit parking should be expanded and that if we solve the high density housing issue this problem goes away. Genis said ZERO tolerance to violators, and increase staffing levels of the Police and Fire Departments. Humphrey agreed, ZERO tolerance and penalize to the maximum allowed. Melone said in his neighborhood some folks spend $1,500 - $2,000 for fireworks and received only a $150 fine. Increase the penalties. Stephens said first limit use of fireworks to ONLY July 4th. He said hire undercover cops to infiltrate neighborhoods and cite offenders. Double the fines. And, he said every dollar in fines collected should go to youth sports. That would increase the possibility of snitches turning in folks for illegal fireworks. Next came a raise of hands - who supports the Smart Growth Initiative? All raised their hands except Stephens, who asked if he could raise it half way. He's not convinced it's the best way to solve the problem. He suggested changing the council instead. The final question - HOW DO WE REUNITE THIS CITY? Stephens said change our attitude about governing the city. Listen to the people, not developers. Melone said new blood on the council, including Latinos. 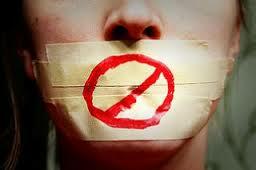 Humphrey said the public is not being heard. 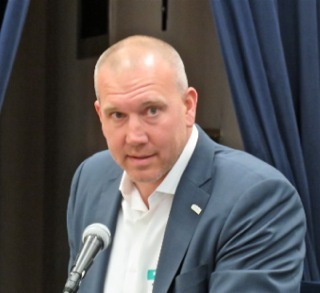 Genis echoed that sentiment and cited recent programs - like the Great Outreach for the General Plan or the voting districts workshops, where resident input was ignored. She suggested NO private meetings to resolve problems - they should be fleshed out in public. Stephens said he was born in 1963 and was named after John F. Kennedy. He quoted Kennedy, "
All this will not be finished in the first one hundred days. Nor will it be finished in the first one thousand days . . .nor even perhaps in our lifetime on this planet. But let us begin." Melone spoke about South Coast Plaza and quality of life. Humphrey told us he has the skills to do the job and asked for their votes. Genis said she's tired of being on the "2" side of 3-2 votes, but she's still been able to accomplish some things. She asked the audience to elect her and others on the dais so we can have a really productive community. Hornbuckle closed by apologizing that all the candidates were not present, but that she had personally reached out to each of those absent. Places had been set at the table, just in case they changed their minds. From my standpoint, this event went very well. Of course, there were no voices of discord. In fact, there were very few folks in the audience that I would describe as avid Mensinger, Mansoor, Ramos supporters. I think, though, that those of who did attend got a better idea of the priorities of the candidates who attended. Thanks to the good folks of Mesa Verde Community, Inc for hosting this event, and to the very special presence of Mary Hornbuckle - the high water mark for a public servant. 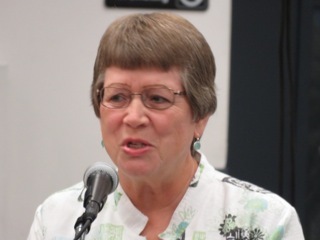 She presently serves as Vice President of the Board of Trustees of the Coast Community College District and will, herself, be on the ballot for re-election in November. To the best of my knowledge, the next candidate forum will be held by my friends at the Eastside Costa Mesa Neighbors Group on October 6, 2016. 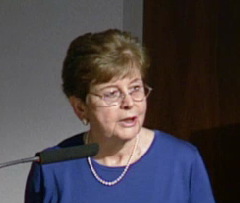 As a sidebar, when Eleanor Egan arrived before the formal program began she was greeted with a round of applause by many in the room and presented with a bouquet of gratitude for her tirelessness in the pursuit of truth on the rebuttal issue mentioned in an earlier post. Again, kudos to her and her persistence in standing up to bullies and liars on our behalf. Breaking News! Egan Prevails In Court! GREAT NEWS FOR THE VOTERS! 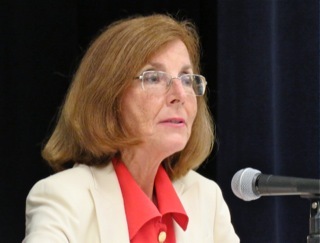 Late this afternoon I was advised that Eleanor Egan prevailed in her court case against City Clerk Brenda Green and Registrar of Voters Neal Kelley to have false and misleading language removed from the rebuttal of the argument for Costa Mesa Firsts Smart Growth Initiative. I wrote about it HERE earlier. TWO-THIRDS OF THE STATEMENT BOUNCED! According to Egan, the judge ruled that two-thirds of the statements made by signatories Jim Righeimer, Chuck Perry, Chris Bunyan, Julie Fowler and Lee Ramos were either false or misleading. So, 14 of the 21 statements in the rebuttal must be removed. The remaining 7, even though some of them are offensive and stupid, may remain. She signed a Minute Order which will be delivered to Kelley, who must respond by removing the offending statements. There is no further recourse in this matter. I'm told that it could be appealed, but that it would not affect this election. Kudos to Eleanor Egan and those who assisted with this strong citizen effort to insure the voters have the truth before them as they make their decison on this very important issue. It's very unusual for the Planning Commission to hold special meetings, particularly during the summer when many meetings are canceled due to vacation schedules of members. This one has only two items on it. Public Hearing #1, HERE, is a code amendment to bring our codes into conformity with the 2015-2035 General Plan that was approved late in June. This one involves the residential overlays and incentives for high density development, primarily along Harbor Boulevard. Public Hearing #2, HERE, similarly brings code changes into conformity with the new General Plan. This one involves rezoning the Fairview Developmental Center property in anticipation of near-term availability if the State closes that facility. When I inquired why a special meeting was necessary I was told there was a specific time limit following the adoption of the new General Plan during which these changes were to be made. I was assured that the pending election had nothing to do with this accelerated process. It's very unlikely that either of these items will get much discussion. The commissioners will just rubber-stamp them and send then on to the City Council for adoption - sometime in September. And, just an FYI, it's my understanding that there are something like 50 Sober Living applications in the pipeline that will start being squeezed into the system next month. Since these things are on a first-come, first-served basis, the operators are anxious to get approvals so they don't get shut out. It ought to make for some very interesting meetings. 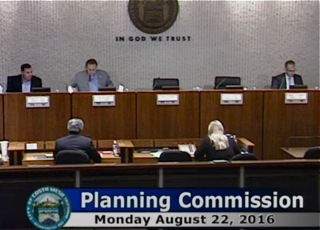 If you blinked you may have missed the Costa Mesa Planning Commission meeting Monday night. Playing with a short deck - Chairman Rob Dickson and Commissioner Tim Sesler were absent and two items were bounced from the agenda earlier - the meeting lasted just short of 55 minutes. 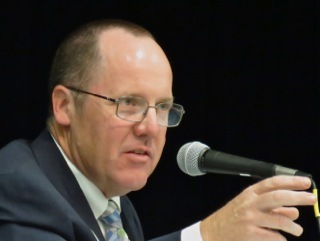 With Vice Chair Jeff Mathews at the helm, he and commissioners Colin McCarthy and Stephan Andranian made quick work of the remaining three items on the agenda. During Public Comments four people spoke - five if you count one fella who took two bites at the apple. Beth Refakes again reminded us of the ball gown drive for the 1/5 Marines at Camp Pendleton. The City is collecting gently-used gowns for the October Marine Ball. Donations of dresses and accessories may be dropped off at the City Hall Lobby. 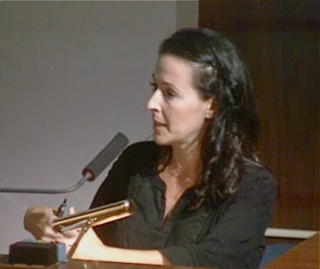 An unidentified fella made a curious demand of Deputy City Attorney Yolanda Summerhill. Nobody could figure it out, including Summerhill. He later came back to comment on sober living homes. 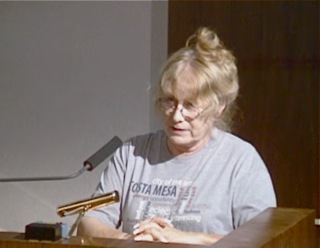 An unidentified woman spoke on sober living homes and told the commissioners that denizens of Eastside sober living homes currently infest the Mariners Library. Jay Humphrey wondered if the new Holiday Club - formerly Maison - had met all the code requirements that plagued the former operation. 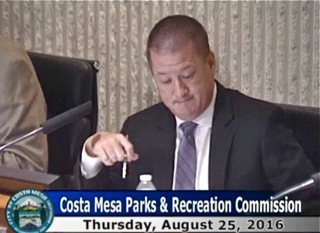 During Commissioner Comments McCarthy wondered if the trail along side the Costa Mesa Country Club could be cleaned up - and suggested the country club be contacted. Andranian observed about the recent rescue of a blind 14-year-old bulldog rescued by members of the Costa Mesa Fire Department from a hole in the ground. See the Daily Pilot story HERE. 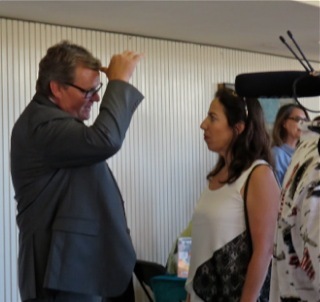 Public Hearing #1, the tidying up of the North Costa Mesa Specific Plan proceeded without public comment and passed on a 3-0 vote in quick fashion. 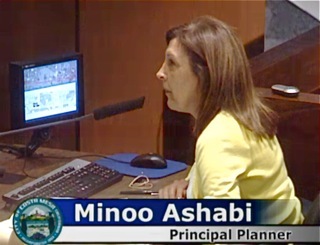 Principal Planner Minoo Ashabi did the heavy lifting on this item and the next one. Public Hearing #2, the 4th amendment to the Home Ranch Development Agreement which, similar to #1, brings that plan into conformity with the General Plan, took about the same amount of time. It also passed, 3-0. 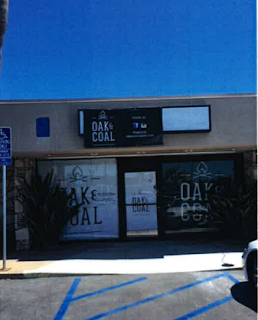 Public Hearing #3, the Conditional Use Permit for serving alcoholic beverages past 11:00 at the new restaurant at 333 E. 17th Street, Oak and Coal, which replaces the Fish and Chips store that had been there for decades, also moved quickly. The operator told the commissioners there would be no alcohol sold without food. It passed on a 3-0 vote. Mathews closed the meeting at approximately 6:55 p.m. - that must be some kind of a record - adjourned it to the next meeting IN A WEEK! Now, that's unusual! Can you say "Sober Living Appeals"? I know all of you who read this blog are just sponges for good information, right? Well, the City of Costa Mesa has made it easy for you to get all the information you need to know this time around in one handy spot. Click HERE to be taken to a page on the City web site titled "City of Costa Mesa 2016 Elections", which is the starting point for your journey to knowledge. Along the left margin you will find buttons that will take you to pages full of good information. But wait! I've provide the links for you below, so just click on the titles below to be taken to those pages. It's going to be the most contentious and complex campaign in recent memory, so every little bit of knowledge you can glean from whatever source could be useful to you as you make your own decisions on candidates and ballot measures. 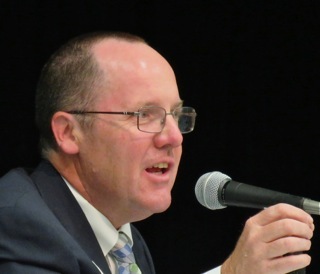 Mayor Mensinger Spews A Crock - Pays A Debt? I am very proud of those who celebrate our city and those who care enough to engage and step into the arena of leadership. 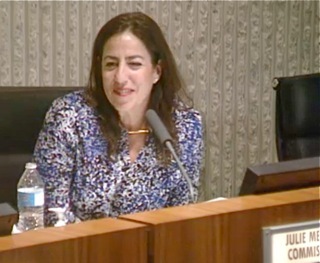 A few weeks ago, Costa Mesa Parks Commissioner Julie Mercurio bowed out of the race for City Council. I believe Mercurio represents the silent majority of Costa Mesa. She has harnessed social media, to make their reasonable voices heard providing a platform for debate, civic information and the empowerment of the heretofore silent majority. The Facebook group, Costa Mesa Public Square, now has over 7,550 members. Mercurio is the future of Costa Mesa. She's a single mom raising two children who wants a safe city they can grow up in. Mercurio is a long-time Costa Mesan who wants improvement and values civility over disparagement. Possessing the rare combination of charisma, an ability to communicate effectively, thoughtfulness and the courage to articulate her positions on issues, Mercurio embodies the wind of change blowing through our city. I hope Julie stays involved. So often we only hear from those that only care to criticize. Mercurio breaks that mold and let's hope she continues to add her brand to our city. Mercurio's infectious smile and positive message is contagious. I want to thank her and hope public service is in her future. Pardon me if I puke! Mensinger praises Julie Mercurio for harnessing social media and the Costa Mesa Public Square, but conveniently neglects to mention that it is a closed site - available only to those who are blessed by Queen Julie herself! If you are not among the anointed you may not participate on that site. In fact, you cannot even read the content! He touts more than 7,550 members, but neglects to mention that many, if not most, of those are not Costa Mesa residents. In fact, many are from out of state! Mensinger credits Mercurio for empowerment of the heretofore silent majority. Hogwash! What she moderates is an echo chamber for those who share Mensinger's views. Remember "The Emperor has no clothes"? That's what the Costa Mesa Public Square is all about. It's populated by a cadre of true believers and a few others who participate out of curiousity - most of the rest are just numbers attracted by membership contests. And, of no small concern is the fact that one of the major thought-drivers on the site is a local racist of international infamy who has found fertile ground for his own special brand of vile bilge. "Possessing the rare combination of charisma, an ability to communicate effectively, thoughtfulness and the courage to articulate her positions on issues, Mercurio embodies the wind of change blowing through our city." 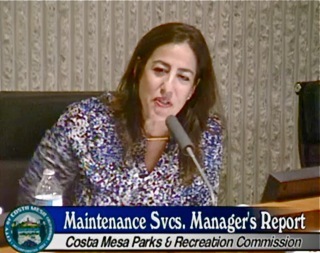 Well, answer me this, Mr. Mayor... just where has THAT Julie Mercurio been during the Parks and Recreation Commission meetings? If we paid her a buck a word we'd be owing her about two dollars for her contributions the past couple meetings! She has contributed nothing - ZERO, NADA, ZILCH - at those meetings, probably because she has no clue about what's going on in those meetings - or anywhere else in the city, for that matter. The only visible public pronouncement we've seen from her was when she first announced her candidacy - a pathetic piece in the Daily Pilot in which she rattled off a bunch of political prattle that meant absolutely nothing. Mensinger complains that "So often we only hear from those that only care to criticize." OK, so what? If he and his cronies would quit doing boneheaded things maybe the criticism would stop. From what I can tell, it's a good thing Julie Mercurio bailed out of the council race - most likely to make room for Allan Mansoor. 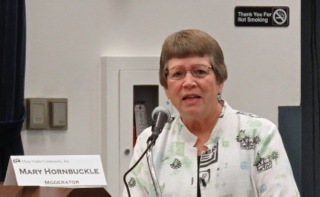 She has demonstrated no grasp of the many important issues that face the city and has apparently been struck dumb at Parks and Recreation Commission meetings since she was appointed to facilitate her public persona for her council run. She was the least qualified person who applied for that opening - by far. She may be a lovely person, but Mensinger's bit of literary drivel on her behalf looks very much like a little "payback" for her decision to drop out of the race. 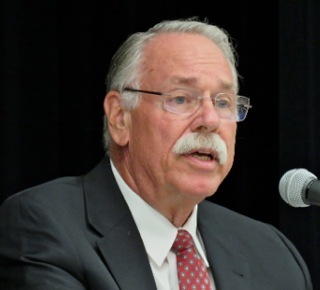 Such is politics in Costa Mesa, and just one more reason to reject Mensinger's run for re-election. He is unworthy of a seat on the City Council and this kind of bilge only further demonstrates that unworthiness.